A 47-year-old woman was admitted to the emergency room due to abdominal pain, constipation and syncope. In the emergency department her blood pressure was 114/81 mm Hg, heart rate 115 beats/minute, room air oxygen saturation 81%, body temperature 36.9°C. Physical examination revealed abdominal fullness and tenderness on the left side, without signs of peritoneal irritation. Plain abdominal X-ray was normal. Chest X-ray revealed a slightly higher position of the diaphragm. Laboratory studies showed hemoglobin level was 7.6 g/dl (the last documented hemoglobin level had been 12.4 g/dl), leukocytes count 20,600/L, platelet count 283,000/L, and the INR 1.48. Acute renal failure was noted with serum creatinine levels of 2.0 mg/dl. Electrolyte levels were normal. Two units of packed cells were administered. Figure 1. 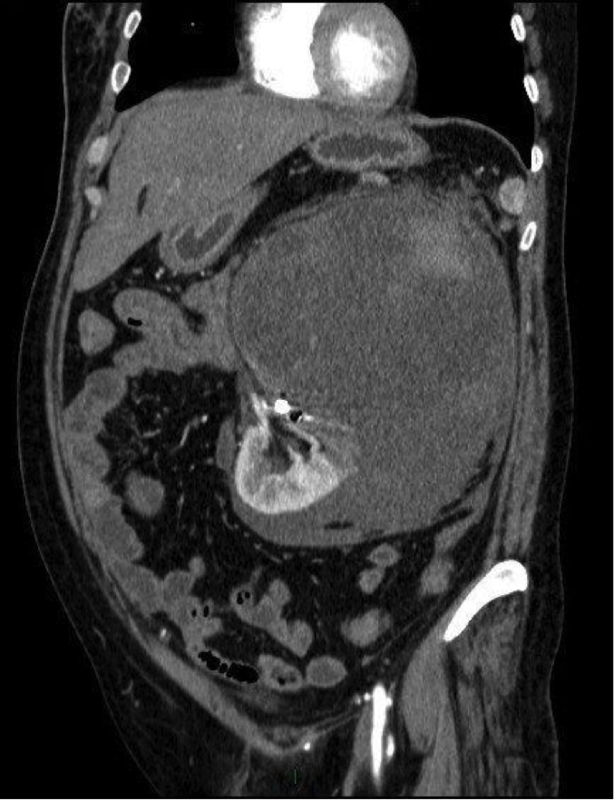 A large retroperitoneal hematoma was revealed by non-contrast enhanced abdominal CT.
Due to the abdominal pain and acute renal failure a non-contrast enhanced abdominal CT scan was performed and it demonstrated a large retroperitoneal hematoma, measuring 16 x 21 cm, pressing the left kidney downwards (Fig.1). The upper pole of the kidney wasn't visualized well, but the lower pole seemed preserved. 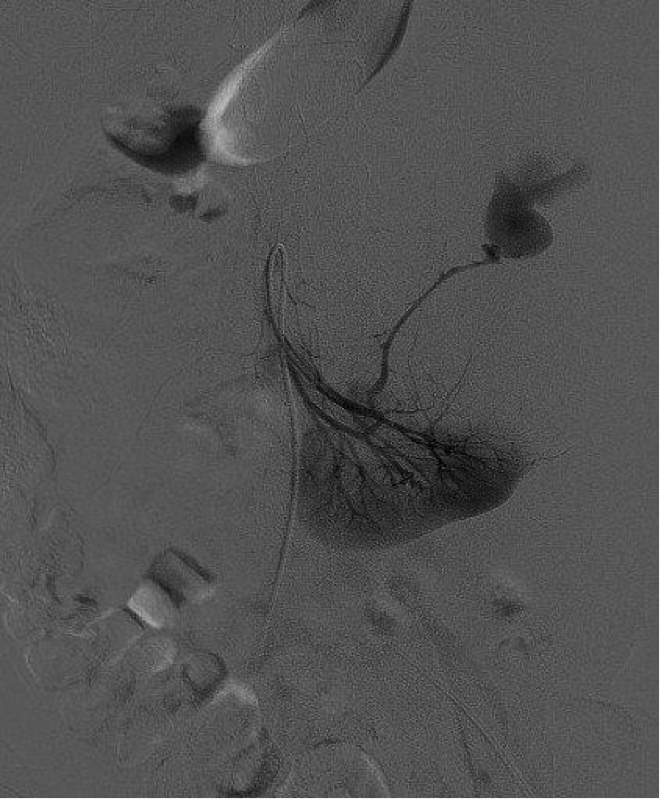 Emergent arterial renal angiography demonstrated active bleeding towards the upper part of the kidney and coil embolization was performed (Fig.2). The patient was admitted to the intensive care unit for close observation, and hemodynamic stabilization of the patient was maintained. Due to the massive bleeding and the suspicion that malignancy was the source of bleeding, nephrectomy was performed. In the pathology report there were foci of high grade renal cell carcinoma. The recovery from surgery was uneventful and on a follow-up evaluation, a year after the operation, there was no evidence of recurrence and creatinine levels remained normal. In this report we wish to raise the awareness of the rare diagnosis of spontaneous retroperitoneal hemorrhage (SRH), its causes, and different treatment options. Retroperitoneal hemorrhage can be spontaneous, iatrogenic or traumatic . In cases a patient is evaluated for abdominal pain and hypovolemic shock, following a renal biopsy, nephrostomy tube insertion, femoral artery puncture or cardiac catheterization, the connection is intuitive for an iatrogenic injury. It is the same for trauma-caused SRH. The diagnosis of SRH is difficult since it is a rare clinical entity, with numerous causal factors. Possible causes are renal angiomyolipoma, renal cell carcinoma, vascular diseases (like vasculitis – most commonly, polyarteritis nodosa, followed by renal artery arteriosclerosis, renal artery aneurism rupture, arteriovenous malformations and fistulas), renal infections, calculus disease, nephritis, cystic renal diseases, coagulation disorders, hemodialysis and anticoagulation treatment  . The clinical presentation is diverse and may be subtle initially. The patient may complain about discomfort and swelling of the abdomen, groin or back. Usually there is no expanding hematoma or any cutaneous manifestation suggesting the presence of retroperitoneal hematoma, which makes the diagnosis much harder. Slight bleeding causing mild tachycardia and hypotension might be overlooked after administration of fluids and improvement of the vital signs. Chronic use of beta blockers can be a pitfall that masks the reflex tachycardia until hypovolemic shock develops. Imaging is the main key in diagnosing SRH, and CT scan is the best diagnostic method  . A CT scan with contrast can help to identify contrast material exstravasation . If there is any evidence of renal failure, an un-enhanced CT scan can be performed to identify a retroperitoneal hematoma, which has a different density than the surrounding soft tissue . The CT scan helps to identify different possible sources of bleeding, assess the presence of a renal mass and its size, and plan the mode of treatment. The initial treatment should include fluid resuscitation, blood transfusion and normalization of coagulation factors, preferably in intensive care unit, regardless of the bleeding-causing factor . If the hemorrhage is self-limiting, the patient can be managed conservatively . On the other hand, if the patient is hemodynamically unstable, intervention is needed. Selective arterial embolization is a favorable mode of treatment, due to the fact that the source of bleeding could be visualized and it is a nephron-sparing procedure. In cases the patient remains unstable, despite fluid resuscitation and unsuccessful radiology intervention, then surgery is indicated. The surgery (partial or radical nephrectomy) is aimed at controlling the bleeding and removing the hematoma . Removal of the hematoma might cause the bleeding to increase, so surgery should be reserved for select cases. In conclusion, spontaneous retroperitoneal hemorrhage is an extremely rare clinical condition, associated with high morbidity and mortality, requiring a high index of suspicion. In cases of conservative treatment or embolization, a close follow-up examination and imaging are required, since malignancy, as the source of bleeding, might be overlooked .